In the summer of every presidential election year, political parties in the United States typically conduct national conventions to choose their presidential candidates. At the conventions, the presidential candidates are selected by groups of delegates from each state. After a series of speeches and demonstrations in support of each candidate, the delegates begin to vote, state-by-state, for the candidate of their choice. The first candidate to receive a preset majority number of delegate votes becomes the party's presidential candidate. The candidate selected to run for president then selects a vice presidential candidate. 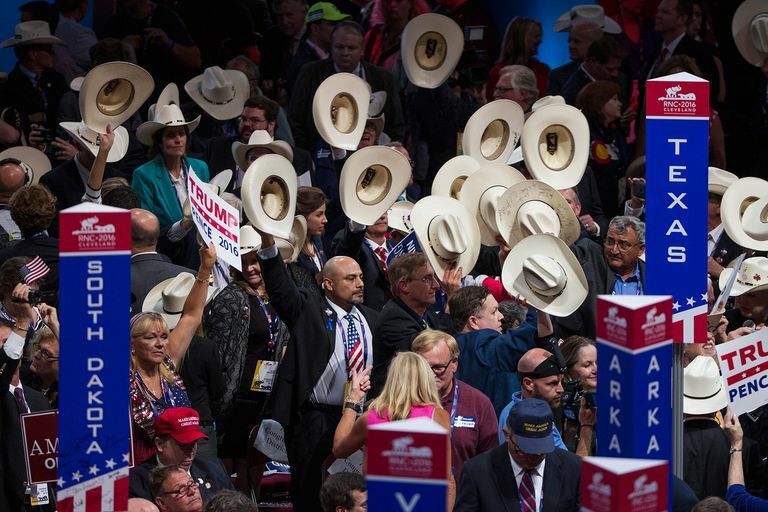 Delegates to the national conventions are selected at the state level, according to rules and formulas determined by each political party's state committee. While these rules and formulas can change from state-to-state and from year-to-year, there remain two methods by which the states choose their delegates to the national conventions: the caucus and the primary. In states holding them, presidential primary elections are open to all registered voters. Just like in general elections, voting is done through a secret ballot. Voters may choose from among all registered candidates and write-ins are counted. There are two types of primaries, closed and open. In a closed primary, voters may vote only in the primary of the political party in which they registered. For example, a voter who registered as a Republican can only vote in the Republican primary. In an open primary, registered voters can vote in the primary of either party, but are allowed to vote in only one primary. Most states hold closed primaries. Primary elections also vary in what names appear on their ballots. Most states hold presidential preference primaries, in which the actual presidential candidates' names appear on the ballot. In other states, only the names of convention delegates appear on the ballot. Delegates may state their support for a candidate or declare themselves to be uncommitted. In some states, delegates are bound, or "pledged" to vote for the primary winner in voting at the national convention. In other states, some or all delegates are "unpledged," and free to vote for any candidate they wish at the convention. Caucuses are simply meetings, open to all registered voters of the party, at which delegates to the party's national convention are selected. When the caucus begins, the voters in attendance divide themselves into groups according to the candidate they support. The undecided voters congregate into their own group and prepare to be "courted" by supporters of other candidates. Voters in each group are then invited to give speeches supporting their candidate and trying to persuade others to join their group. At the end of the caucus, party organizers count the voters in each candidate's group and calculate how many delegates to the county convention each candidate has won. As in the primaries, the caucus process can produce both pledged and unpledged convention delegates, depending on the party rules of the various states. The Democratic and Republican parties use different methods for determining how many delegates are awarded to, or "pledged" to vote for the various candidates at their national conventions. Democrats use a proportional method. Each candidate is awarded a number of delegates in proportion to their support in the state caucuses or the number of primary votes they won. For example, consider a state with 20 delegates at a democratic convention with three candidates. If candidate "A" received 70% of all caucus and primary votes, candidate "B" 20% and candidate "C" 10%, candidate "A" would get 14 delegates, candidate "B" would get 4 delegates and candidate "C" would get two delegates. In the Republican Party, each state chooses either the proportional method or a "winner-take-all" method of awarding delegates. Under the winner-take-all method, the candidate getting the most votes from a state's caucus or primary gets all of that state's delegates at the national convention. Key Point: The above are general rules. Primary and caucus rules and methods of convention delegate allocation differ from state-to-state and can be changed by party leadership. To find out the latest information, contact your state's Board of Elections. The 2020 Democratic National Convention will be held from July 13th to 16th, 2020, at the Fiserv Forum in Milwaukee, Wisconsin. Since by tradition, the convention of the party currently holding the White House is held after that of the opposing party, the 2020 Republican National Convention will be held on August 24th to 27th, 2020, at the Spectrum Center in Charlotte, North Carolina. When Did the Last Brokered Political Convention Happen?